the Cheyenne. Photo is by Edward Curtis. I'm doing an essay on the anti-Western Western novels of the 1960's and 1970's, mainly focusing on the latter decade. I read earlier Ishmael Reed's The Yellow-Back Radio Broke Down, which I really couldn't get into, though reading some articles about it helped a bit. It was funny enough at times. 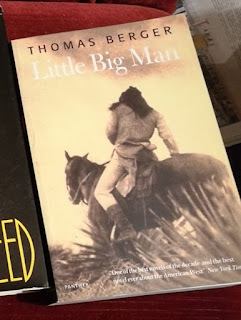 Yesterday I finished a more famous novel, Thomas Berger's Little Big Man (1964) that's known also - actually better - as a movie by Arthur Penn, starring Dustin Hoffman. Neither of the books have ever been translated in Finnish, which is a pity. This was a great novel, epic in scope, hilarious in execution, though it's actually never laugh-out funny, though I remember the film being very funny. Maybe I didn't catch every meaning or phrase. As everyone knows, I'm sure, what happens in the course of the book, I won't go into there, so here are instead some observations. Little Big Man should be included in the canon of postmodern novels. Berger uses a framing device in which a young scholar named Ralph Fielding Snell who studies American Indian culture gets to meet 121-year old Jack Crabb, whom he interviews in length. I think that's basically a postmodern narrative device, and actually a bit reminiscent of Vladimir Nabokov, especially when Fielding Snell's voice is a bit stuffy. Jack Crabb is played by Dustin Hoffman in the film. It's been a while since I saw the movie, but I seem to remember he's very affable in it. In the book, Crabb is more unpleasant and more opportunist, possibly uncapable of really loving anyone, so Hoffman is possibly miscast. Am I right in this regard or did I just misinterpret everything I read?